Youth Bike Summit Starts Tomorrow! 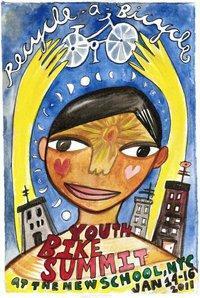 DESCRIPTION: The 1st annual Youth Bike Summit is a 3-day gathering geared towards students, educators, and advocates. The conference aims to inspire people from different educational disciplines to explore, network, and learn how bicycling can be a legitimate and safe form of transportation for today’s youth. With this mission in mind, the Youth Bike Summit will offer educational workshops and panel discussions on subjects ranging from how to advocate for bike lanes to basic bike maintenance. It will also provide tools and information on fundraising and best practices for schools that wish to incorporate bikes into the physical fabric of the learning environment. ADMISSION: $10.00 per person for the 3-day event. Registration continues in-person at the event. FOR MORE INFORMATION: Please visit our website: www.recycleabicycle.org or contact Pasqualina Azzarello at 718.858.2972 or director@recycleabicycle.org The Youth Bike Summit is also on Facebook. ACCOMMODATIONS: For groups traveling from out of town, we recommend Hosteling International New York for accommodations. Guests of the Youth Bike Summit can reserve rooms at a reduced rate through their website with the promotion code YBS2011. Promotion is effective January 13-19. HISTORY: In March 2010, Recycle-A-Bicycle (RAB) attended the National Bike Summit with two high school interns who had completed a comprehensive job training and Earn-A-Bike program at RAB. Both participants learned they loved bicycles and expressed an interest in learning more about how bicycling fits into policy, the environment, social entrepreneurship, and community-building. Traveling to Washington DC for the first time, the 17 year old interns explore the nation’s capital by bicycle, on an 8 mile tour led by a representative of WABA (Washington Area Bicyclist Association). As we debriefed on the bus ride home, we discussed the importance of engaging youth in the national dialogue of cycling and cycling education. As a result, the idea of the Youth Bike Summit emerged. Both young advocates have been active participants in the planning of the conference thus far. The Youth Bike Summit was made possible by generous and ongoing support from The New School, Bike New York, the J.M. Kaplan Fund, REI, Bicycle Habitat & The Government of the Netherlands.